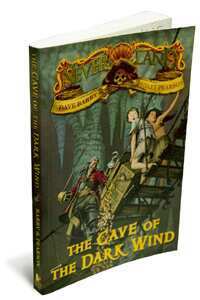 The Cave of the Dark Wind: By Dave Barry and Ridley Pearson, Walker Books, 176 pages, Rs200. The Dave Barry-Ridley Pearson novels are set as a prequel to J.M. Barrie’sPeter Pan, the boy-hero who can also fly. Peter’s adventures are set before Barrie’s works.The Cave of the Dark Windis the second in the Neverland series, which is a continuation of thePeter and the Starcatcherstrilogy. The Cave of the Dark Wind begins with Peter visiting his friend in England, leaving James, Prentiss, Thomas and Tubby Ted at Mollusk Island. Giving them company are the island’s princesses, Shining Pearl and Little Scallop, daughters of the island chief, Fighting Prawn. According to legend, she tells them, there is a cave on top with a creature that eats goats. The villagers, in order to keep this creature away from their children, sacrifice a goat on full moon nights every month. Moreover, the cave is infested with millions of bats, some of them dangerous. The mysterious tale only arouses the boys’ curiosity and they vote to explore the cave. In a terrifying first attempt which sees them leave in a tearing hurry, the boys discover a skull with two gold coins in each eye socket. The boys guess that there is pirate treasure inside and decide to come back the next day armed with torches. Unfortunately, their discovery is spotted by two of the pirates who happen to chance by. The pirates know that the gold coins have come from the ship Mariposa that sank around these waters. And that there is a treasure chest full of coins waiting for them inside that cave. What follows is a heart-stopping tour—for the adventurers—through the maze of channels that lead to the treasure. With Shining Pearl, who has a nose for strange smells, guiding them, they have a good chance of pulling it off. And they are motivated by the fact that they have a thing or two to show off to Peter when he gets back. A humour columnist, Pulitzer prize-winner Barry’s work has appeared in more than 500 newspapers in the US and elsewhere. Barry and good friend Pearson are right up there with the best. This is Treasure Island and Robinson Crusoe rolled into one. Barry’s other achievements include playing the lead guitar in a literary rock band called the Rock Bottom Remainders whose members, apart from Pearson, include authors Stephen King, Amy Tan and Mitch Albom. The writer is the editor of Heek, a children’s magazine.